TOQUERVILLE — A vehicle rollover on a frontage road near Toquerville Saturday resulted in an arrest for suspected drunken driving. Shortly after 4 p.m., units of the Washington County Sheriff’s Office and Utah Highway Patrol responded to reports of a single-vehicle rollover on Mills Lane, a road that parallels northbound Interstate 15. 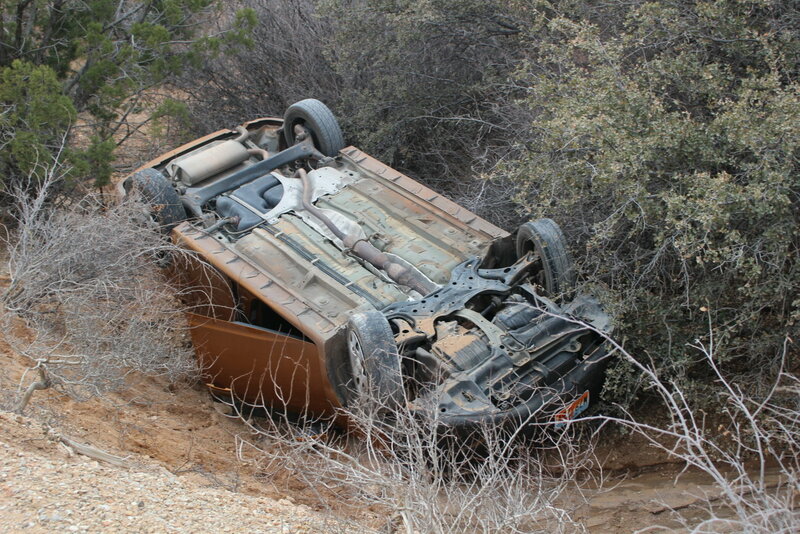 What responding units found was a 2010 Toyota Matrix that had gone off the road and rolled onto its top into a small wash by the side of the road. The vehicle was northbound then it veered off the road, according to the statement. The driver, a 40-year-old LaVerkin resident, was the sole occupant of the vehicle. No injuries were reported in connection with the rollover. Though the cause of the accident is still under investigation, the driver was arrested and booked into the Washington County Purgatory Correctional Facility for driving under the influence of alcohol, along with a traffic charge related to the accident.